Children’s Paper Tube DIY Eco-Furniture is Customizable and Fun! Last weekend at the International Contemporary Furniture Fair we fell in love this amazing customizable eco kid’s furniture line, made from paper! 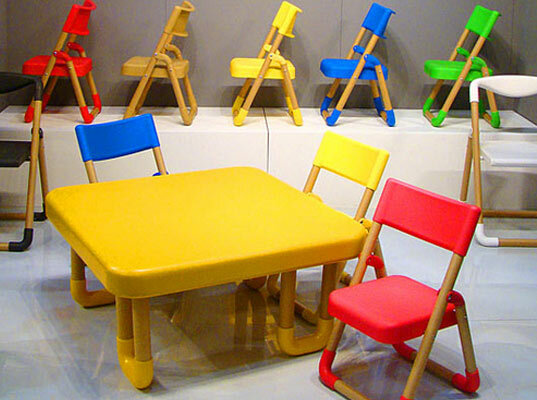 The HECMEC folding chairs and tables are made up of paper tubing connectors that can be colored on and exchanged out in order to change in size as your child grows. 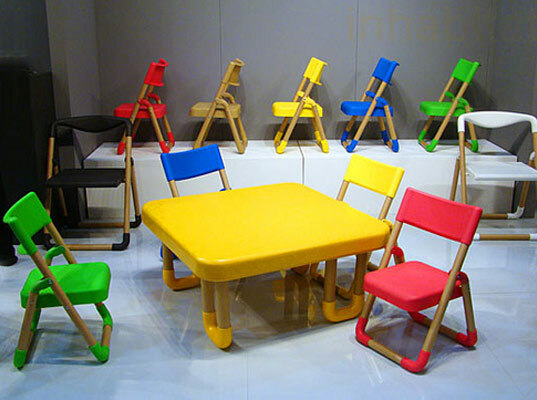 The colorful assortment of little furniture designed by Japanese company Sankei Co. are so thoroughly thought out that they not only encompass loads of environmental value — they also provide a super smart product that is educational, fun and child safe. The paper tube connectors provide a blank canvas for your little ones to customize each piece on their very own using markers or stickers. This is one time where coloring on furniture will actually be encouraged! Since the tubes can be changed out and recycled, these products are intended to be long lasting, versatile and great for the home or any educational environment. The HECMEC website suggests customizing the tubing to suit a classroom theme, for example, drawing animal prints on the tubing for biodiversity class. The chairs are also carefully designed to fold up for easy storage – simple enough for a child to handle by preventing any risk for finger injuries. The furniture is manufactured with minimal environmental impacts — by exchanging typical steel tubing with paper tubing, the fabrication process lowers CO2 emissions by 40%. The colored components are made of a plant-based resin that is also able to be recycled along with the paper tubing. Just when you thought things couldn’t get any better – at purchase, part of the proceeds are donated to an organization that implements international activities for sustainable futures for children around the world. Your article is very good in many respects. maybe it would be great if given a description of the image data in addition to your article. Children�s Paper Tube DIY Eco-Furniture is Customizable and Fun! HECMEC Children’s Furniture Line by Sankei Co.
Last weekend at the International Contemporary Furniture Fair we fell in love this amazing customizable�eco kid's furniture line, made from paper!� The�HECMEC folding chairs and tables are�made up of paper tubing connectors that can be colored on and exchanged out in order to change in size as your child grows.� The colorful assortment of little furniture designed by Japanese company Sankei Co. are so thoroughly thought out that they not only encompass loads of environmental value -- they also provide a super smart product that is educational, fun and child safe.